When it comes to weight loss, 99% of thyroid sufferers have it all wrong. …would you think that using a hair re-growth product would help fix your thyroid? It’s not addressing the real underlying cause of the hair loss. It’s what we call a band-aid fix that just covers it up. So, why do so many thyroid sufferers believe that if they could just lose a little bit of weight their thyroid problems would all disappear? Weight gain (and excessive weight loss) is a symptom of hypothyroidism. 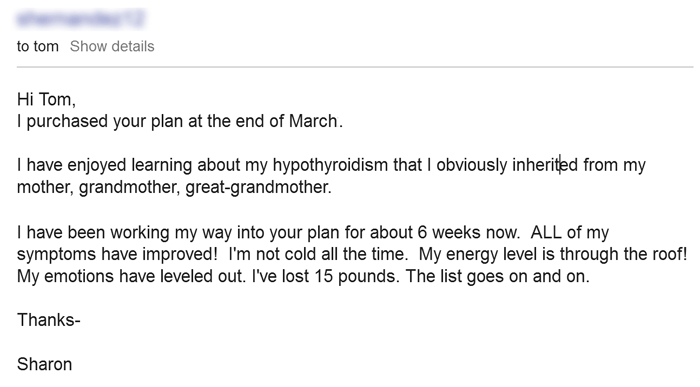 So, you don’t lose weight to fix your thyroid… you fix your thyroid first to lose weight. When you do it the right way, you can get results like Sharon. However, it’s not always easy… which is why most thyroid sufferers try to lose weight in very dangerous ways. And the worst part is that they don’t even realize how much harm they are truly causing by making these hypothyroidism weight loss mistakes. …only to set themselves up for even more weight gain in the future. We’ll cover the four biggest hypothyroidism weight loss mistakes in a second, but first you need to know what makes them so dangerous, and why forcing weight loss only leads to long term weight gain. Because you’re hypothyroid, you have a lot going against you making weight loss sometimes seem impossible. But it’s unfortunate to what lengths some are willing to go to lose a few pounds. Many of my clients have confided in me personally, telling me about the drastic measures they’ve taken in the past. And in many cases, the damage done from previous dieting has become so severe that it can take a long period of time to dig themselves out of the hole they’ve dug themselves into. Few ever realize that these dangerous weight loss mistakes work by sacrificing long term thyroid health for short term weight loss. This results in further suppression of your thyroid and you becoming even more hypothyroid in the process. …this almost always leads to regaining of any lost weight, plus more. These four hypothyroidism weight loss mistakes oftentimes do result in weight loss. However, they do so by depleting your liver and muscles of glycogen/sugar and over-activating your body’s stress response. In other articles we’ve covered how this over-activating of your stress response results in further suppression of your thyroid by both further blocking your Thyroid Hormone Pathway along with perpetuating other hormonal imbalances. (Note: Not sure what your Thyroid Hormone Pathway is? See this article on “How We Overcome Hypothyroidism When All Else Fails”). So, while you might be seeing a downward trend on your scale, you might be surprised to find that it’s coming from almost all the wrong places. Healthy organs and muscles weigh more than unhealthy organs and muscles because they store lots of glycogen. …leaving you a few pounds lighter, not because of fat loss, but at the expense of your organ and muscle health. When glycogen is depleted and blood sugar drops, your stress response becomes over-activated and you secrete lots of cortisol to compensate. Cortisol works by breaking down healthy muscle tissue to convert it into sugar to bring your blood sugar back up. …but it does so, not by fat loss, but by the loss of healthy muscle. And because lean healthy muscle tissue increases your metabolic rate, your metabolism takes a nosedive too, promoting future weight gain. While it may not seem like a lot, your bones account for roughly 15% of your bodyweight. A healthy person with a healthy metabolism stores a lot of carbon dioxide in their tissue and bones, resulting in greater bone density and bone weight. Hypothyroidism, carbon dioxide loss, and stress hormones all play a direct role in the loss of bone mass. This is the one that most are trying to achieve, oftentimes with little success. And this is because most methods used to “promote” fat loss do so by forcing your adrenaline levels higher and higher. Adrenaline works in part by releasing fatty acids from your fat cells as an alternative source of fuel. However, this also blocks your cells from being able to use thyroid hormone efficiently. The truth is that you’re not designed to waste fat by under-eating or killing yourself in the gym. You’re designed to use fat when our body is at rest and energy demands are low. This allows your body to release small amounts of fatty acids that won’t compromise your thyroid health in the process. Otherwise, you’re simply pushing yourself further into a survival state that promotes long term weight gain. And that’s exactly what all of these hypothyroidism weight loss mistakes do. If you’re using, or have used, any of these methods to lose weight, then unfortunately it has come at the expensive of your thyroid. Most doctors will tell you the answer to losing weight is to simply eat less. But we both know that doesn’t work, especially not in the long run. But I’ve had many clients who have gone prolonged periods of time eating 500 to 1000 calories per day, trying to simply maintain the few pounds they lose and prevent it from coming back. I’ll tell you what it takes for healthy weight loss in a second, but it doesn’t involve eating less. Low-carb diets have become the go-to diet for those looking to lose weight. But they too work by depleting liver and muscle glycogen, and flooding your body with stress hormones. Because low-carb dieters produce predominantly cortisol, the majority of weight loss comes from the wasting of healthy muscle tissue and from loss of glycogen weight in the organ and muscles. The higher cortisol oftentimes also leaves you with less muscle and more belly fat. And in any event, low-carb diets are well known for suppressing your thyroid and metabolism setting you up for future weight gain. (Note: Want to learn more about how low-carb diets are dangerous for your thyroid? Take a look at this article on “Stop Eating Low-Carb (If You Care About Your Thyroid)”. Intermittent fasting (or intermittent starving as I like to call it) has gained a lot of popularity lately. The idea is that by eating for a period of time, and then starving yourself for a period of time, you can lose weight faster and in a healthier way. Unfortunately, it’s not healthy at all for hypothyroidism sufferers. While this may be possible for someone with healthy liver function, as a hypothyroidism suffer that’s something you’re lacking. During the fasting portion of this type of diet, your liver can’t store enough glycogen to keep your blood sugar stable. So, it still elicits the same stress response followed by the same thyroid suppressive effects of these other diet mistakes. Not only do doctors tell you to eat less, they oftentimes tell you to exercise more. However, think about that for a second. Glycogen is a source of fuel for your body. So, if your liver and muscles aren’t storing fuel, exercise might not be the best solution. Exercise (cardio exercise in particular) causes your body to use what little fuel it does have very quickly. And once you’re out of fuel, the thyroid suppressive stress hormones start pouring in. This is why many hypothyroidism sufferers become so fatigued so quickly when attempting to exercise. Anytime you overexert yourself physically, your thyroid suffers. So, What Is the Best Way to Lose Weight with Hypothyroidism? Unfortunately the whole idea of eating less and exercising more just doesn’t work. At least not in the long run. The only safe way to do it is to maximize and maintain your thyroid health and metabolism, which oftentimes requires you to eat more, not less. And as Dr. Raymond Peat points out, the more your metabolism heals the more nutrition you need to sustain it. This is how eating more can oftentimes lead to more weight loss. But when done in a healthy thyroid supportive way, weight loss becomes a slow and steady process. And it’s a process that leads to long term sustainable weight loss. So, remember, you don’t lose weight to fix your thyroid. You fix your thyroid to lose weight. 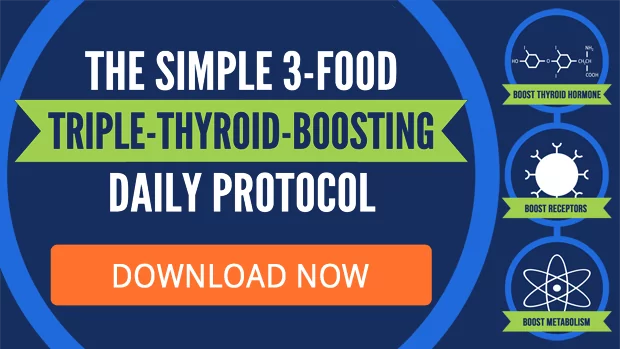 And an easy way to get started fixing your thyroid is to use our 3 Food Triple-Thyroid-Boosting Daily Protocol. will this work on me as they removed my whole thyroid ,and since then my weight went from 85 kilos to 140 kilos ?? how do i stop gaining weight and start losing it instead ?? What do you do when you can’t eat carbs because of having SIBO? Every time I eat fruit or starchy carbs, I get intense pains. I agree with you that low carb destroys the thyroid, I feel much warmer, sleep better, and put muscle weight on when I do eat more carbs, but my stomach just won’t tolerate them. I’m really not sure what to eat anymore, and barely weigh much over 100 pounds. I need help! Thanks for the great articles! With an elevated cortisol, I was recommended to avoid coffee… How will this interfere with the 3 food daily protocol? Still unsure about dairy. Do we eat full fat or low fat dairy? Also, still unsure why we can’t eat nuts. Is it because the oils in nuts are PUFAs? I’m starting to understand the science behind the program and I am seeing some improvements. Just wondering if I’ll ever be able to eat some of the forbidden foods someday occasionally. So excited for the hope I now have for healing. Thanks for getting the info out there to us.